Ugandan politics took a sad walk onto the world stage at the end of 2009, when David Bahati, a member of Parliament, introduced a bill to gruesomely enhance his country’s existing laws against gay people – making it a crime not to report gays, and going so far as to call for the execution of gays in some circumstances. The death penalty provisions have not become law, but Uganda remains hostile territory. Kushaba Moses Mworeko, a brave 31-year-old Ugandan and my personal hero, decided to speak out in February against the bill at the American Prayer Hour. This event countered the National Prayer Breakfast run by the notorious and powerful aanti-gay organization, The Family. At the National Press Club, Moses joined Truth Wins Out, The Human Rights Campaign, GLAAD, Americans United, and several other organizations to speak out against The Family’s role in Uganda and the horrible “kill the gays” bill. 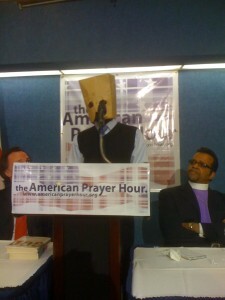 For his safety, Moses wore a paper bag over his head. 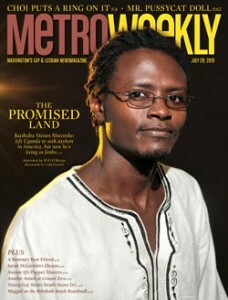 Today, he reveals himself to the world in an effort to stop the persecution of LGBT people in Uganda. The message of Moses: “Let my People Go. What an incredibly brave and inspiring person! The publication MW has an excellent interview, discussing Moses’ activism, life journey and efforts to stay in the United States to avoid persecution, imprisonment or worse. It is imperative that Moses stays in the United States. It would be unconscionable if he were sent back to suffer at the hands of would-be murderers.